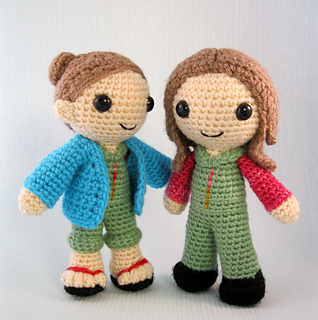 With this pattern you can crochet two versions of Kaylee, Serenity’s cheerful and goodhearted mechanic. 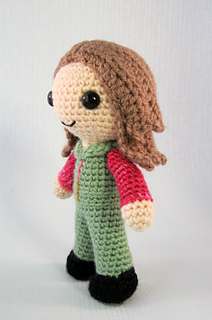 Make one version with her hair up, wearing sandals and a removable jacket, and another with long hair and boots. 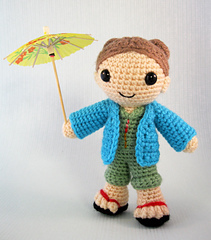 The pattern is suitable for crocheters with a little experience. 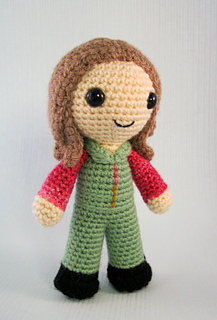 The instructions are detailed and easy to follow if you know the basic stitches and techniques used to make amigurumi. 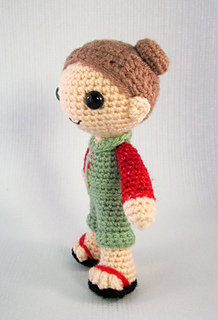 They are written in English using US crochet terms, and the list of abbreviations includes the UK alternatives. The pattern is a downloadable PDF file and you will need Adobe Reader to open it. I will be happy to answer any questions you may have as you are making it. Finished size: approximately 16 cm/6.5” tall. Use double knitting (dk) weight yarn, the amounts listed below are approximate. This is equivalent to light worsted weight yarn. You can substitute worsted weight yarn, but the amounts needed may be slightly more. 15g - 20g light skin colour yarn (larger amount for figure with sandals). 15g green yarn, light khaki or sage colour. 10g pink or red yarn for sleeves, variegated if possible to give a patterned effect. 15 - 20g dark beige yarn (larger amount for figure with long hair). Small amount of gold yarn for zip. Small amount of black embroidery thread or yarn for mouth. 1 pair 10.5mm black safety eyes.